Another magical unicorn was seen in our kitchen this week! As parents, grandparents, aunts, and uncles, we often see something and think to ourselves, “Gasp! 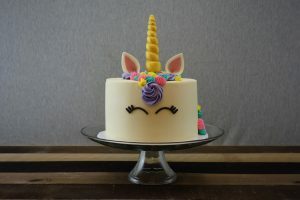 (Insert name of a loved child) would absolutely love that!” That’s exactly what happened with a doting father and my unicorn cake from a few weeks ago. Well, I doubt that he gasped, but he knew that his daughter would fall in love with the cake and wanted to give her one for her birthday. This was my first official order after my maternity leave and I could not be happier that it is going to a sweet little girl to help make her 3rd birthday celebration even more magical and special. Happy birthday, Kadence! 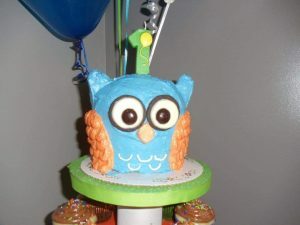 As I create the cakes, cupcakes, and cookies that my customers order, I like to think about the recipients and how they will react to their unique treat and also about the special occasion that they are celebrating. This usually leads me down memory lane to significant occasions in my life. 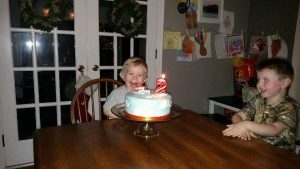 In this case, I was taken back to some of my boys’ particularly memorable birthdays. This was the very first cake that I made for one of my children. It was the night before Jack’s first birthday and I remember being up so late trying to finish this cake. He wasn’t sleeping through the night yet, so I had to stop several times during the making of this cake to go put him back to bed. It was worth it, though. At “cake time”, Jack wasn’t quite sure about the whole smashing of the cake idea, so I tried to tempt him to really get into the cake by giving him a taste of the buttercream frosting. 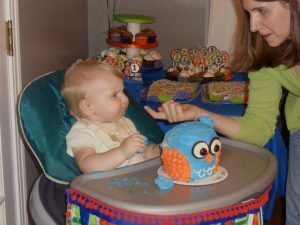 He was still skeptical and eventually let us know that he was NOT happy about all of the cake and frosting on his hands. 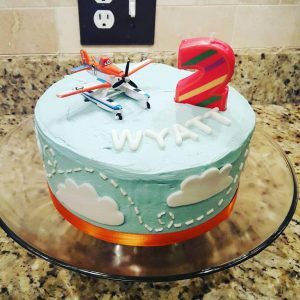 This was Wyatt’s second birthday cake and it will forever hold a special place in my memory and heart. He was crazy about airplanes at the time, so he loved the cake. But the part that is so special to me is what happened when we were singing Happy Birthday to him. It has to have been the happiest Happy Birthday that has ever been. There is no other way to explain it except to say that there was pure joy on his face. Wyatt giggled and smiled the entire time, which caused the rest of us to laugh and smile, too. It was so sweet and innocent. I have the whole thing on video and it is truly one of my most treasured moments. It is a true honor whenever a customer chooses me to play a part in their birthday celebration because it’s not just cake or cookies that I create. It’s the backdrop to a special day that may stay in their hearts for the rest of their lives. That is not something that I take lightly or for granted.